Bloomington Meadows Hospital is dedicated to helping patients restore their health and get a fresh start. We provide each patient with comprehensive behavioral and mental health counseling programs from a compassionate and caring staff. We are committed to the wellness of our patients, their families and the communities that we serve. Click here to see how you can prepare for your visit to Bloomington for an assessment and see a list of suggestions to get you started. Looking to grow your future at Bloomington Meadows? Click above to learn more about working with us. The team of professionals at Meadows is comprised of board-certified physicians and master’s level clinicians for both adult and youth acute inpatient care. Bloomington Meadows Hospital offers outpatient services to new patients and continuity of care services to anyone who has had an inpatient stay. Bloomington Meadows Hospital offers physician-supervised detox care to adults and outpatient care upon discharge. I thank you all for a good job. "I would love for my son to come home and go to school and be a better person for himself and for me and others. I thank you all for a good job." Your kindness was so appreciated! "We just want to thank you for all of the help you gave (our son). Your kindness was so appreciated! We could reduce our worries know that (our son) was at a place where the staff truly cares. Thank you very much!" I believe that Meadows truly does save people. "I believe that Meadows truly does save people. They take people at their very worst when no one else understands them." I truly thank you for giving me the tools to be a better person. "Thank you for the kindness & respect I received while I was at Meadows. I truly thank you for giving me the tools to be a better person." If you’re looking for an opportunity to build the career of your dreams and joining a team of professionals passionate about helping people, Bloomington Meadows is the place for you. Because we believe that each person is unique, all treatment plans are individually designed to meet specific needs. The focus of treatment is practical and solution focused with an emphasis on symptom reduction and learning healthy coping skills. Get the latest updates from our facility. Bloomington Meadows Hospital is accredited and licensed by the state of Indiana. it is an environment dedicated to helping patients restore their health and get a fresh start. Bloomington Meadows provides each patient with comprehensive behavioral health treatment from a compassionate and caring staff. their families and the communities that we serve. in our area by providing quality that helps our patients and their families start their journey toward healing. 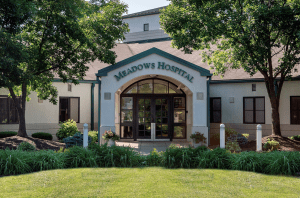 Physicians are on the medical staff of Bloomington Meadows Hospital, but, with limited exceptions, are independent practitioners who are not employees or agents of Bloomington Meadows Hospital. The facility shall not be liable for actions or treatments provided by physicians. Model representations of real patients are shown. Actual patients cannot be divulged due to HIPAA regulations. © 2019 Bloomington Meadows Hospital. All rights reserved.